2. Derwentwater: Keswick's "lake among the fells"
Keswick, Cumberland (now Cumbria) was the hometown of Commander W. Roger Marshall-A'Deane, D.S.O., D.S.C., A.M. (1902 - 1941). He was among the most decorated Allied Naval Commanders of WW2. Commander W. Roger Marshall-A'Deane of Keswick, Cumberland (1902 - 1941) was the younger son of Mr Richard Marshall, originally of Enholmes, Panington, E. Yorkshire, and Mrs Gertrude Ellen Marshall, originally of Geraldine, New Zealand. He entered the service of the Royal Navy under his original surname of Marshall during the First World War - in 1916 - and attended Osborne Royal Naval College. Following his 1926 marriage in New Zealand to Miss Margaret Hamilton A'Deane the then Lieutenant Roger Marshall added the maiden name of his bride to his own family name. Henceforth the happy couple were known by the family name Marshall-A'Deane. The couple had met in New Zealand when Lieutenant Walter Roger Marshall and Lieutenant Laurence Lyonel Tollemache, who were both officers from HMS Dunedin at the time visited the A'Deane family home of Ashcott, Takapau, Hawke's Bay on New Zealand's North Island. At the time, Lieutenants Marshall and Tollemanche were attachés to Lord Jellicoe, Commander in Chief of the Royal Navy, a regular visitor to Ashcott while he in New Zealand. On the same day that Lieutenant Roger Marshall married Margaret A'Deane, Lieutenant Tollemanche married Margaret's sister, Violet, in a double marriage ceremony. Lieutenant Tollemanche, R.N. also went on to become a Commander in the Royal Navy and served in WW2, where he had the misfortune to be taken prisoner by the Japanese at Singapore in 1942. After WW2 Mrs. Margaret Marshall-A'Deane eventually returned to her former homestead of Ashcott, Takapau, New Zealand. Mrs. Marshall-A'Deane passed away in 1970: once more reunited with her husband. Shortly before the outbreak of WW2, on 5 July 1939, Roger Marshall-A'Deane was appointed Commanding Officer of H.M.S. Greyhound (Pennant No H05). She was a G Class destroyer of the Royal Navy. Commander Marshall-A'Deane would remain with 'Greyhound' until she was lost on 22 May 1941. For the Dunkirk evacuation (June 1940). It was under Commander Marshall-A'Deane's command that the 'Greyhound' flashed its searchlight on three Italian cruisers during the Battle of Cape Matapan that resulted in two of the cruisers being sunk by the first shots of the Royal Navy Battle Fleet. The Battle of Cape Matapan proved to be one of the key naval battles of WW2, involving the British and Italian Navies. This defeat of the Italian Navy meant the Italians never again sought battle with the British Navy. If any proof was required to illustrate Commander Marshall-A'Deane's gallantry it can clearly be seen in his final action of the war. This brave Naval officer gave his life in an attempt to save the lives of others, with completed disregard for his own personal safety. It was for this final act, on 22 May 1941, that Commander Marshall-A'Deane was awarded the Albert Medal. His gallant sacrifice took place during the Battle for Crete which had begun when German airborne troops attacked the Allied garrison on Crete. The Allied garrison included a large proportion of men from the New Zealand Expeditionary Force under General Bernard Freyberg, V.C. After coming under attack by German dive bombers, the 'Greyhound' was hit by three bombs. It was the third bomb that knocked out Greyhound's 3-inch gun. Although the 1/2 inch guns continued firing 'Greyhound' sank four minutes after being hit the third time. The destroyers 'Kandahar' and 'Kingston' went to the aid of the stricken 'Greyhound' and managed to rescue many of the crew: including Commander Marshall-A'Deane. However, later in the day H.M.S. Fiji was also sunk and H.M.S. Kandahar once again attended to rescue the crew. It was at this late stage in the day that Commander Marshall-A'Deane dived into the water in an attempt to save some of the crew of H.M.S. Fiji. "When his ship, H.M.S. Greyhound, was bombed and sunk - in repelling the invasion of Crete by sea - Commander Marshall-A'Deane was among the survivors picked up by H.M.S. Kandahar. Later in the day H.M.S. Fiji was sunk and H.M.S. Kandahar again went to the rescue. Commander Marshall-A'Deane, despite the ordeal he had already been through that day, dived overboard in the gathering darkness to rescue the men in the water. He was not seen again. This was the last proof of his great gallantry." The significance of the Albert Medal can be seen when one considers it was eventually replaced by the George Cross - second in precedence only to the Victoria Cross. The Royal Warrant for the Institution of the George Cross only appeared in the 'London Gazette' on 31 January 1941. Hence, at the time Commander Roger-A'Deane was posthumously awarded the Albert Medal, the George Cross was a relatively new gallantry award. The situation regarding the George Cross and the Albert Medal was clarified in two stages after the war. Firstly, in 1949, the Albert Medal in gold for lifesaving was replaced by the George Cross. Between 1949 and 1971 the Albert Medal was only awarded in bronze to posthumous recipients. Secondly, in 1971 the Albert Medal ceased and all living recipients were invited to exchange the Albert Medal for the George Cross. However, relatives of those who had been awarded a posthumous Albert Medal - as was the case for Commander Marshall-A'Deane - were not able to convert the medal to a George Cross. Commander Roger Marshall-A'Deane is commemorated by his hometown of Keswick, Cumberland (now Cumbria). Along with other casualties from the Keswick area there is a simple listing of his name on the Keswick War Memorial and the WW2 War Memorial at Crosthwaite Parish Church (Church of England). 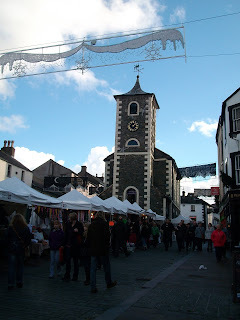 The market town of Keswick is situated at the northern end on Derwentwater. Some of the buildings in the Market Square (Photograph No 1 above) have a 'German' feel to them. Principally this is because of the influx of German miners and their families into the district during the reign of Queen Elizabeth I. The last German kaiser, 'Kaiser Bill', also visited Keswick in 1895 as a guest of the Earl of Lonsdale. 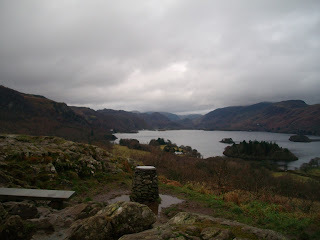 Derwentwater is Keswick's "lake among the fells" (Photograph No 2). Although some distance from the sea it is a body of water where sailors can develop their skills from an early age. Keswick and Derwentwater are known throughout the world for their scenic value and for some, a place for peaceful reflection and creative activity (see Photograph No 3 above). The Marshall family were not the only people with strong links to New Zealand to settle in this area. It was at Brackenburn on the shores of Derwentwater that the New Zealand born writer and broadcaster Sir Hugh Walpole (1884 - 1941) made his home. 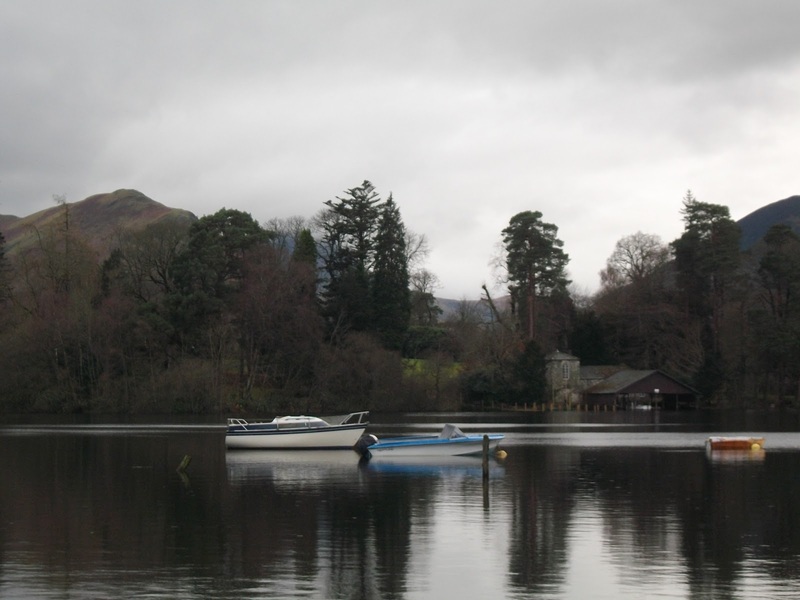 In the middle of Derwentwater is an island of peaceful beauty that some regard as a sacred place for peaceful reflection: St Herbert's Island. It is named after St Herbert, a 7th Century hermit and friend of St Cuthbert of Lindisfarne. 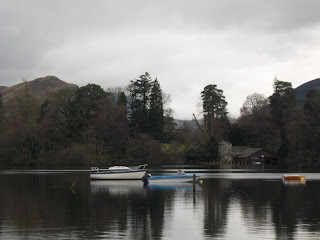 Sailors who regularly take boats out on Derwentwater have often visited the island for some quiet contemplation. This article is dedicated to the memory of Commander Walter Roger Marshall-A'Deane, D.S.O., D.S.C., A.M.
" ... We are an island race, through all our centuries the sea has ruled our destiny. There will always be other ships and men to sail in them. It is these men, in peace or war, to whom we owe so much. Above all victories, beyond all loss, in spite of changing values and a changing world they give to us, their countrymen, eternal and indomitable pride. God bless our ships and all who serve in them." The fictional story of H.M.S. Torrin in the film "In Which We Serve" was inspired by the true story of a destroyer lost in the Battle for Crete: H.M.S. Kelly (Pennant No F01). The 'Kelly' was commanded by Lord Louis Mountbatten. Regiment/Service: Royal Navy, H.M.S. Greyhound. Panel Reference: Panel 45, Column 1. Husband of Margaret Hamilton Marshall-A'Deane, of Takapau, Hawke's Bay, New Zealand.